No need to prepare individual solution. Highly effective, yet easy to use. It deodorizes ,eradicates and cleans! ＊Since all the protein leading to allergy is removed, you can use it in comfort. 100% natural ingredient (Nano Soy Colloid) No chemical substance is used. 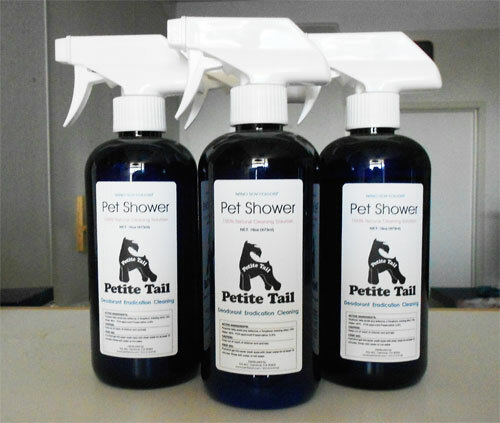 The original pet spray from PetiteTail is made of Nano Soy Collide made by Soy beans and water. It does not include any chemical substance, such as synthetic surfactant or hypochlorous acid. Therefore, it can be used for pet or even at home around small children with no worry. All in one for deodorization / disinfection / washing. Completely kills virus and source of odor. Analysis by official organization proved that Nano Soy Colloid is highly effective for deodorization / disinfection / washing. O-157, Noro virus, an influenza virus, etc. are disinfected by 99%. It decomposes powerfully and deodorizes source of odor, such as ammonia gas and hydrogen sulfide. It can be used for multiple purposes for deodorants, moisturizer for skin, brushing tooth and etc. Not only for Deodorization / Disinfection / Washing, it also effects for mold proofing, insect control, static electricity removal, moisturizing for skin and etc. Therefore, it is great for brushing fur after taking a bath and brushing tooth. You do not have to purchase individual solution. This will cover them all. You can buy at PetiteTail !! 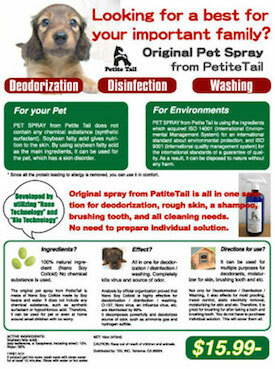 PET SPRAY from Petite Tail does not contain any chemical substance (synthetic surfactant). Soybean fatty acid gives nutrition to the skin. By using soybean fatty acid as the main ingredients, it can be used for the pet, which has a skin disorder. PET SPRAY from Petite Tail is using the ingredients which acquired ISO 14001 (International Environmental Management System) for an international standard about environmental protection, and ISO 9001 (international quality management system) for the international standards of a guarantee of quality. As a result, it can be disposed to nature without any harm. If product get into eyes: wash eyes with clean water for at least 15 minutes. Rinse with water or hot water. CAUTION: Keep out of reach of children and animals.